After being dormant for many years in my favorite participation sport, I found my new Table Tennis club on the peninsula. It’s called the Peninsula Table Tennis Club (simple enough), and it’s located in Burlingame–right on the bay. I went this evening for the first time, and it was a stellar experience. The people were very inviting and happy to have a new player. I purchased a new blade and new rubber for my return, and decided to go with the new Timo Boll ZLF offering (blade) combined with the new Tenergy 05 FX rubber. Wow is it fast. I mean…silly fast. It’s a new fiber that’s even lighter than carbon, but it’s wicked speedy. Combined with the Tenergy rubber it’s just brutal. 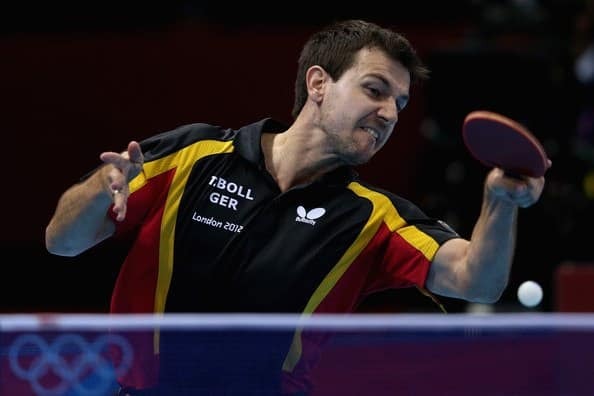 I’m finding that with the Timo Boll ZLF I’m having a similar issue as I had with the Timo Boll TriCarbon, which was a very high trajectory off the bat that I find difficult to control. My default blocks and hits shoot far higher than with my Timo Boll Spirit, which is also a carbon blade. Anyway, I’m trying to adjust. I tried going back to my old bat halfway through my session today (the Spirit with some old Bryce on it) and it was jarringly slow. I figured I was already adjusting to the new speed so there’s no point in going back now. I just need to figure out how to handle that higher trajectory. The speed of this setup makes my touch play very weak. It’s weak enough as it is, but my serve return was just horrendous today. The speed of the thing makes all your touch mistakes very costly ones, as in…immediately deadly. I kind of like that, though, as it forces me to commit entirely to everything. Doing anything halfway (or with poor technique/form) with this blade/rubber combination yields comically poor results. Anyway, it was great to play today, and I’m enthused to have a new club and new equipment to work with. Also, my mind feels so quick right now, as a result of the workout; it’s like my mind finally got a bath. Table Tennis, for those who don’t know, has been shown to improve all sorts of cognitive functions. Anecdotally, I’m a believer.